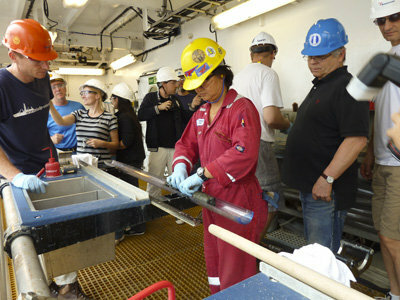 After 16 days of perseverance, we got our first core on deck this morning at about 8:30 am. These two weeks of reaming, cleaning, cementing, and reaming and cleaning again have been long, and sometimes a bit stressful. I can see a lot of smiling faces around; it looks like we will now eventually be able to deepen Hole 1256D. This first core was short, the recovery was only 7%, but that is a good start, and we are waiting for more now. Everybody in the lab is ready to describe and measure!